Are you heading west this fall for The Big E? I know The Big E is far from Boston but I know many people make the trip so I figured I’d share some discounts your way! The Big E is celebrating 100 years of delicious food and fun from September 16, 2016 to October 2, 2016 and is New England’s biggest fair. General admission tickets are $15 for adults and $10 for children ages 5-12 at the gate. However, there are a few different ways to save on admission tickets to The Big E.
Discounted tickets are available online for $12 for adults and $8 for children when purchased by September 14, 2016 at 11:59pm (so today). Also, discount tickets are available on Opening Day, September 16, 2016 for $10 for guests of any age except children 5 and under who are free. Opening Day is also Military Appreciation day and military members with proper ID can enter for free. 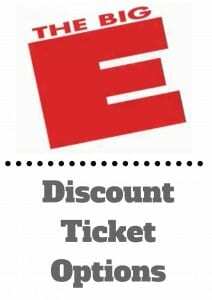 If you are planning to attend The Big E multiple days, there’s a $40 unlimited entry pass for adults and an unlimited entry pass for children for $20. Admission to The Big E is $6 after 5pm on Mondays through Thursdays. For more information regarding The Big E or to purchase tickets, please head here.